Honduras has an estimated 116,000 gang members. 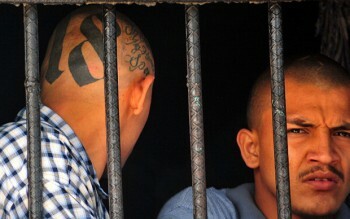 The MS13 and Barrio 18 appear to be the dominant gangs in Honduras, but smaller groups like the Chirizos, West Side, and the Mara 61 also exist. The Honduran government, however, is strategizing to eliminate this criminal element. The Honduran military is now working together with the military in El Salvador in an effort to secure our border in the departments of Ocotepeque, Lempira, Intibucá and La Paz, in the hopes of hindering the passage of gangs into Honduras. “We have increased the presence of our Armed Forces and FUSINA (National Inter-Agency Security Force) to prevent members of Mara Salvatrucha 13 or Barrio 18, from El Salvador, from entering Honduras,” according to Brigadier General Fredy Díaz, Honduras Army Chief of Staff. The Subordinate Inter-Agency Task Force Santa Bárbara (FTIS Santa Bárbara) and the First Engineering Battalion are blocking blind points with explosives and heavy machinery to prevent gang members, drugs or weapons from crossing the border. Additionally, El Salvador stepped up action against gangs with the deployment of three battalions of Special Response Forces (FER) consisting of 600 service members. In response, gang members have fled to blind points along the border; but the military is following them there as well, sending service members to the Sumpul Command along the border in the departments of Chalatenango, Cabañas, San Miguel and La Unión. “…we have reinforced the efforts along the border through the Sumpul Command, and we have a security deployment at 130 blind spots along the border to prevent gang members from crossing and any weapons trafficking they might commit,” said Brigadier General William Mejía, the El Salvador Army Chief of Staff. The current landscape of organized crime in Honduras has its origins in the United States, among the gang culture of Los Angeles. The largest gangs operating in Honduras today, Mara Salvatrucha and M18, originated in Los Angeles among communities of Central American migrants in the 1980s. At that time, many migrants arrived in the area from El Salvador and Nicaragua, fleeing civil wars in those countries, only to become the victims of street crime in L.A. — From E International Relations.